Good morning folks, it was the first evening match at the Lake of Tranquility last night and may I add considering the cold wind it fished really well with over 350lb of fish caught between 14 anglers. 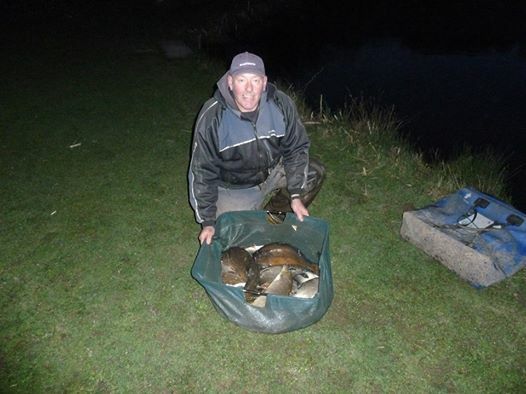 Top rod was Shaun Sandham with 54lb 8oz using pole at six meters with pellet and meat off peg 27. Second was Kev Williams off peg 12 using pole again he weighed 53lb 2oz third went to Martin Churchill off peg 2 with 45lb, well done to all that took part. Don’t forget our day match tomorrow draw 9am fish 10-4pm then on Friday we have our evening match draw at 1pm fish 2-8pm PLEASE BOOK FOR ALL OUR OPENS ON 07751 235728 OR 07767 880005 THANK YOU AND TIGHT LINES. This entry was posted in Latest News, Matches, Tuesday Match Results by lakeoftranquility. Bookmark the permalink.